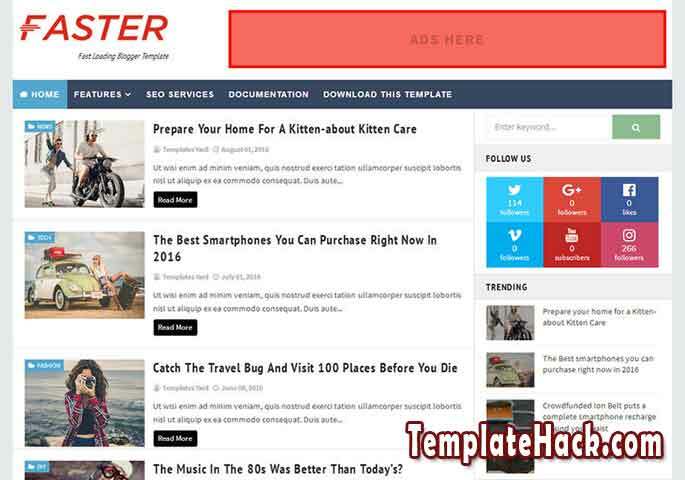 TemplateHack.com - Download Faster Fast Loading premium blogger template. Faster Fast Loading is simple blogger template with elegant looking. It is suitable for any niche blogger template such as banking blog, ecams blog, tutorial blog, institution blog, review blog, etc. This template is a blazing fast loading that load very quick. Also, Faster fast loading design 100% responsive that will fit in on any device. Get this free premium blogger template by click the download button below. Breadcrumbs, browser compatibility, ads ready, page navigation menu, multi colors, minimalist, stylish, whatsapp sharing button, elegant, white, drop down menu, social bookmark ready, retina ready, fast loading, simple, mobile friendly, responsive. Wordpress look blogger template, adapted from wordpress blogger template, magazine blogger template, fashion blogger template, personal blogger template, business blogger template, corporate blogger template, food blogger template, review blogger template, how to blogger template, movie blogger template, critics blogger template, tutorial blogger template.